This is a typical Indian salad which is very simple to prepare and also a very healthy dish. This salad can be served with rice or can be taken as such. It is low in fat, so can be taken by those who want to reduce weight. Children love this very much. Since my children like the crunchy taste of capsicums very much, I have added it. In traditional recipe capsicum is not added. Today we will learn to make Karnataka special Kosambari salad. Peel the skin and chop cucumber and carrots. Wash and soak moong dal in water for 1 hour. After 1 hour, drain the water completely. Add chopped cucumber, carrots, capsicums and tomatoes to the dal. Heat a tsp of oil, add mustard seeds, when mustard splutters, add ginger, green chillies, asafoetida and saute for a few seconds. Add it to the lentil mixture. Add salt, juice of half a lemon and mix well. Finally add grated coconut and mix gently.Healthy Traditional salad is ready to be served. Note - Add salt at the time of serving. Meet you all again with more interesting recipes. Thank you for visiting Padhuskitchen. Simple, healthy and delicious!! I am loving it!! Like you said, this look healthy and refreshing. Have awonderful vacation.SAlad looks beautifully presented and very creatively clicked.Healthy too. Such a refreshing, healthy and delicious salad, looks fantastic..
very colourful and so beautiful...loved this one and your presentation.. This is so beautiful and healthy. Thanks for sharing. Superb healthy salad..will try soon as I need to loose some weight..
so colorful and wonderful looking koshimbir! moong daal is a really good addition to it. Deliciouu salad, cucumber carrot flower looks really good. Typically Healthy and Colorful Salad. Very well presented. Adding Tomato and Lemon must have made it tangy as well. Yummy and this look healthy and refreshing!!! Integral part of the south Indian festival meal.. Looks colorful and delicious! Great presentation as always!! Salad looks colorful and healthy.. 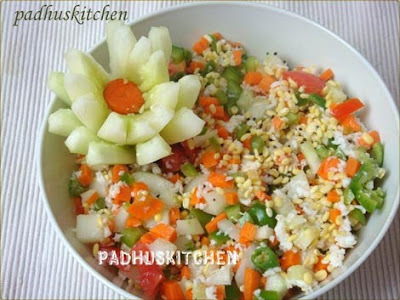 Superb..Cool cucumber, carrot salad for hot summer. Healthy and refreshing salad... well presented. Thanks for dropping by my blog Padhu. I am following your blog. we often make this but without the lentils. your presentation makes it look perfect. Salad looks superb n perfect. Very healthy salad.When I see a new post from you in my dashboard amidst my busy day I will be curious and quickly open to see your creativity ,u never disappointed me:). wow..very healthy salad...loved the flower garnish ..
nice healthy and colorful salad. Thanks for coming by my blog. Haiii!! !Padhu,,Hw r u ter dear,,,kosambari looks great dear n very healthy option of salad,,Happy holidays dear..
what a simple and a healthy salad! Lovely one. that's a nice nutritious crunchy munchy delicious salad!!! colourful and appetizing, love the combinations of the ingredients!! lovely presentation too!! enjoy your stay at your mom's place !!!!!! Have a great time at your mom's place.My name is Maya. A fresh, healthy and delicious salad! this salad looks so healthy and refreshing!perfect summer salad. Yum. Lovely salad! I am a huge kosumbari fan. Have fun at your mom's! Healthy, colorful and Delicious ! Looks awesome ans I'm sure must be tasting delicious. Thanks for visiting my blog. Kosambari is one of my favourite and it looks really good in your blog. Healthy and delicious salad. Beautiful presentation as well. Enjoy your vacation and see you soon. Looks light, refreshing and healthy to me. there are some awards waiting for you in my blog, pls collect them, enjoy your vacation..
A very yummy salad..One of my all time favorites. Capsicum is a nice addition.Beautiful cucumber and carrot flower.Hope you had a Happy Vacation. Gotta say, I just made this and was actually pretty disappointed. Not much going on flavorwise...actually kind've bland. Adding some chopped cilantro did help, but it's still pretty bland. Also, unless you're thinking of serving it as a main course, I think this could actually be fine serving 3-4 as a side.